A striking four-bedroom showhome at Greenfields, a development by David Wilson Homes Southern in Overton, has been awarded a Special Commendation in the Evening Standard New Homes Awards. The award in the ‘Best New Family Home with up to Five or more Bedrooms’ category was collected by Sharon Smith, sales manager for David Wilson Homes Southern, at a glittering Oscars-style ceremony hosted by television personality and comedian Rob Brydon at The Dorchester Hotel, Park Lane, London. 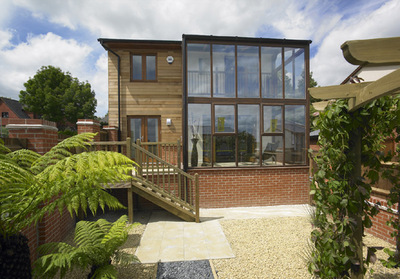 The three and four-bedroom houses all achieve the BRE Environmental Assessment Method (BREEAM) Ecohomes ‘Very Good’ standard; this assessment process balances environmental performance with the need for a high quality of life and a safe and healthy internal environment. The showhome demonstrates all the ‘green’ features in the scheme, including a two-storey solar space conservatory, solar heating panels and a rainwater recycling system. Low energy lighting is used at Greenfields, with dedicated fittings throughout. Other features include solar water heating to all homes and high-efficiency space-saving heating. The houses have passive stack ventilation systems to kitchens, bathrooms and en suites with the air naturally drawn upwards; creating a healthy environment and saving on electricity. All domestic water outlets are fitted with flow restrictors. All tap outlets are aerated; this gives the user a feeling of ‘softness’ and reduces the tap’s flow rate without appearing to do so. Showers are low-flow (nine litres per minute or less) and WC cisterns have a dual 2.5 and 4 litre flush. Rainwater harvesting units at each house supply rainwater to the WCs, washing machines and external taps (for car washing and gardening). The properties are constructed with materials sourced from responsible suppliers, such as timber from well-managed sustainable forests. The majority of homes are south-facing to maximise solar power and reduce the need to use the boilers, and so lowering emissions. When complete, Greenfields will comprise 75 two, three and four-bedroom houses, including 22 affordable homes, in a peaceful setting on the edge of Overton village, with views over the River Test to fields and woodland. Greenfields certainly ticks all the boxes, with a good choice of schools and colleges in the area. For commuters, Overton train station is less than a mile from the development with direct services to London Waterloo taking around an hour. Road links are great too; Overton is only a short distance away from the M3, A303 and A34. Prices for homes currently available at Greenfields in Foxdown, Overton, Basingstoke, RG25 3JF, start at £323,995 for a three-bedroom house and £379,000 for a four-bedroom house. The showhomes and sales and marketing suite are open Thursday to Monday, from 10.30am to 5.30pm. For more information, visit Greenfields-overton.co.uk.